Stay with us before and after your High Adventure or Family Rafting Trip. OWL's 25 acre Lakeside Resort is the hub of all our activities that culminates the day on the river with a truly special holiday experience for our guests. We offer affordable overnight accommodations in rustic cabins or waterfront camping for tents and RVs. Unique in the world of whitewater rafting the OWL experience on the Ottawa River combines a full-day descent of the famous Rocher Fendu rapids, with a return cruise aboard our Pontoon Boat enjoying a freshly grilled BBQ meal. The River Trip: At the top of every rapid, the guide explains the run, requests a â??thumbs-upâ?? before steering the raft into laughing waves, where everyone will get wet. Quiet pools intersect the rapids â?? a great place to relax, take in the wilderness scenery, spot a blue heron or swimming beaver and recharge for the next â? ?Big Oneâ??. Body surfing, raft surfing, cliff jumping, sandy beach lazing are all a part of every raft trip. Taking in two more rapids making for the longest river trip on the Ottawa, OWL meets up with their infamous Pontoon Boat where you change into dry clothes for a delicious grilled meal with fresh salads and home baked bread. Afternoon trips get to enjoy a golden sunset for the cruise back to the OWL Resort. 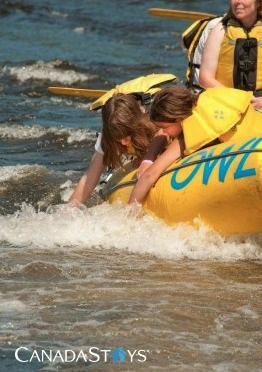 Camping can only be purchased if rafting with us on a 1-DAy, 2-Day or Family Rafting trip at OWL Rafting on the Ottawa River. The OWL Resort is located on the calm section of the Ottawa River - Lac Rocher Fendu. Our waterfront boasts a sandy beach with kayaks, canoes, pedal boats, and SUP's. For children OWL's beachside playpark and natural labyrinth through the tall grasses, as well as the new Pump-track for biking keeps them well entertained. AS does the Disk Golf course for adults. Fishing off the dock brings great enjoyment to all ages. Whitewater is a workout - it does wonders for the appetite. Our recipe is simple: hearty fare with a touch of flair...we call it the OWL advantage. Staying overnight with us includes Breakfast in the lakeside pavilion. Lunch is served on the Pontoon Boat, at the end of each rafting trip. Dinner is an option to buy into, or cook your own 'beach-side'. All meals are prepared freshly, often sourced locally and using herbs from our own gardens. The OWL Resort is located on the calm section of the Ottawa River - Lac Rocher Fendu. Our waterfront boasts a sandy beach with kayaks, canoes, pedal boats, and SUP&#039;s. For children OWL&#039;s beachside playpark and natural labyrinth through the tall grasses, as well as the new Pump-track for biking keeps them well entertained. AS does the Disk Golf course for adults. Fishing off the dock brings great enjoyment to all ages. Whitewater is a workout - it does wonders for the appetite. Our recipe is simple: hearty fare with a touch of flair...we call it the OWL advantage. Staying overnight with us includes Breakfast in the lakeside pavilion. Lunch is served on the Pontoon Boat, at the end of each rafting trip. Dinner is an option to buy into, or cook your own &#039;beach-side&#039;. All meals are prepared freshly, often sourced locally and using herbs from our own gardens.